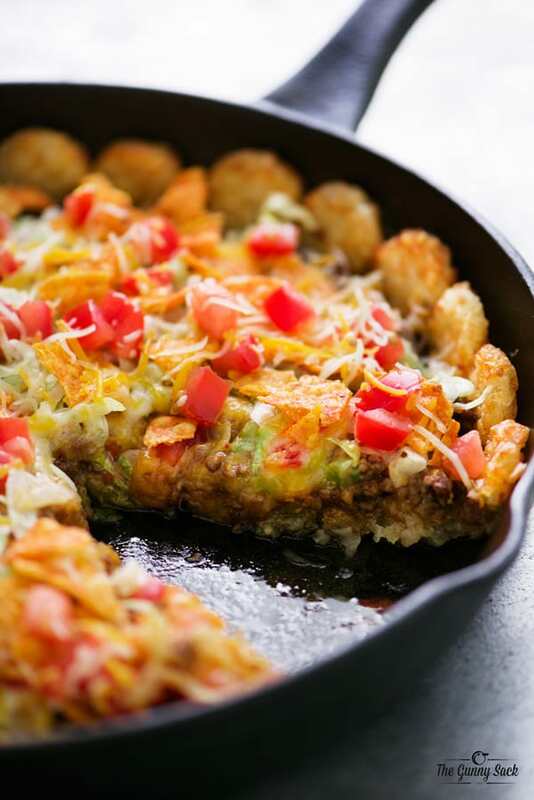 Tater Tot Taco Pizza is a mouthwatering combo of two of your favorite eats: tacos and pizza! The tater tot crust makes this dinner recipe even more fun. There is a pizza shop in our area that makes some fun versions of the classic pizza and one of them in a Taco Pizza. I already have a Taco Pizza recipe on my website but I wanted to make another version with a yummy twist. Instead of the traditional pizza crust, I made a tater tot crust for this Tater Tot Taco Pizza! Cover the bottom and sides of a greased 12-inch cast iron skillet or oven-safe pan with tater tot crowns (these are the round, flat tater tots) Bake at 425° for 15 minutes. While the tater tots are baking, brown the ground beef and drain the fat. Add water, diced tomatoes, taco seasoning, and minced onion. Stir and cook for 3-4 minutes, until thickened. 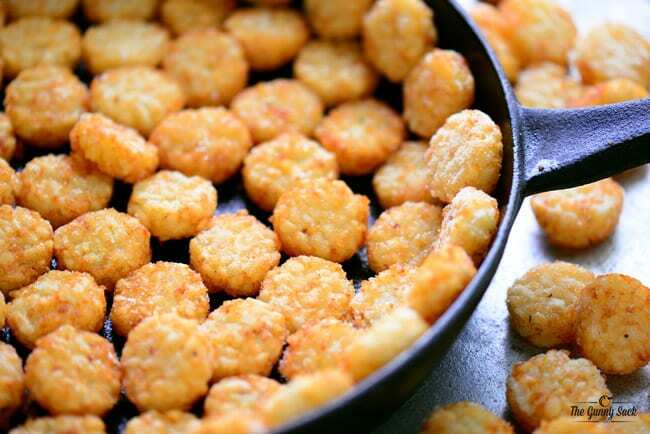 Remove the tater tots from the oven and flatten them with a spatula. Top with one cup of shredded cheese and the taco meat mixture. Drizzle with taco sauce. Finish it off with another cup of shredded cheese. Bake for an additional 10-15 minutes at 425°. Remove from the oven and top with shredded lettuce, crushed Doritos or tortilla chips, diced tomatoes, and shredded cheese. 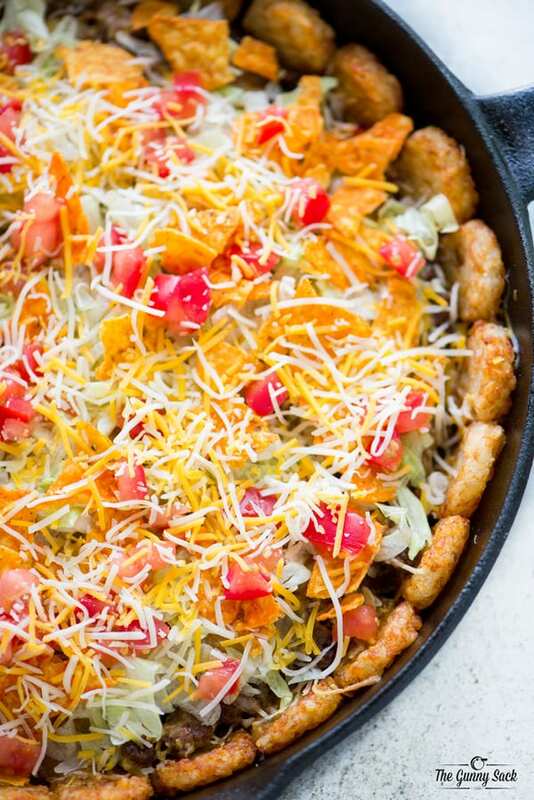 This delicious Tater Tot Taco Pizza can easily be customized to include all of your favorite taco add-ins from black beans and peppers to sour cream and cilantro. 1. Can this be made in a 9×13″ pan instead? Yes, you can make it in a 9×13″ pan but keep in mind that you will probably need more ingredients to cover the pan. 2. Would this work on a cookie sheet? If you want to go the cookie sheet route, I would suggest using one with sides since this recipe is a kind of greasy and you don’t want the grease to run off of the pan into your oven. 3. Can I use regular tater tots instead of the crownies? Yes, it will just be a bit more bumpy. 4. Can I use hashbrowns instead of tater tots? If you mean hashbrown patties or rectangles, those would work. As far as shredded hashbrowns go, they would probably work for the bottom but wouldn’t be very crispy. 5. Do I have to use a cast iron pan? No, I used mine to help get the tater tots crispy but you can use another casserole dish of your choice. Cover the bottom and sides of a greased 12-inch cast iron skillet or oven-safe pan with tater tot crowns. Remove the tater tots from the oven and flatten them with a spatula. 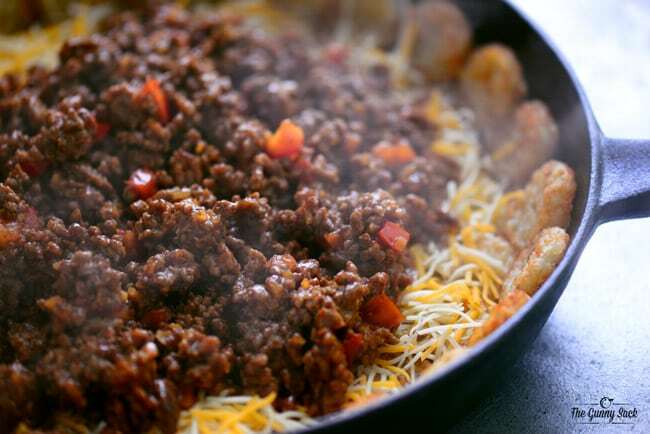 Top with one cup of shredded cheese and the taco meat mixture. Drizzle with taco sauce. Finish it off with another cup of shredded cheese. Bake for an additional 10-15 minutes at 425°. Made this tonight, it was a hit with everyone. Thank you. I made it in a cookie sheet. Turned out just fine. Wasn’t sure how this recipe was going to go over with my family. Everyone, especially my mother-in-law, are picky eaters. Surprisingly everyone loved it. It was quick, simple, and different. I will definitely be making it again. All of my recipes can be printed. If you look at the recipe card near the bottom of the blog post there is a gray print button directly below the small photo. Here is the printable one for this recipe: https://www.thegunnysack.com/easyrecipe-print/17159-0/ Enjoy! I tried printing this recipe. The link says it no longer exists. I hit the print symbol under the recipe, it came up in a printable form but didn’t have anything from this point that said print. So I was unable to print the recipe. I copy them and email them to myself so I can print them out Just highlight the recipe, hit control C, them open you email and hit control V and send it to yourself. I do not have a cast iron pan could you use a 9 x13 glass pan? Or would it not work in it? I have made this in a 9×13 and it is just as good this way too. Yes will need extra of the ingredients but it is super delicious made either way. 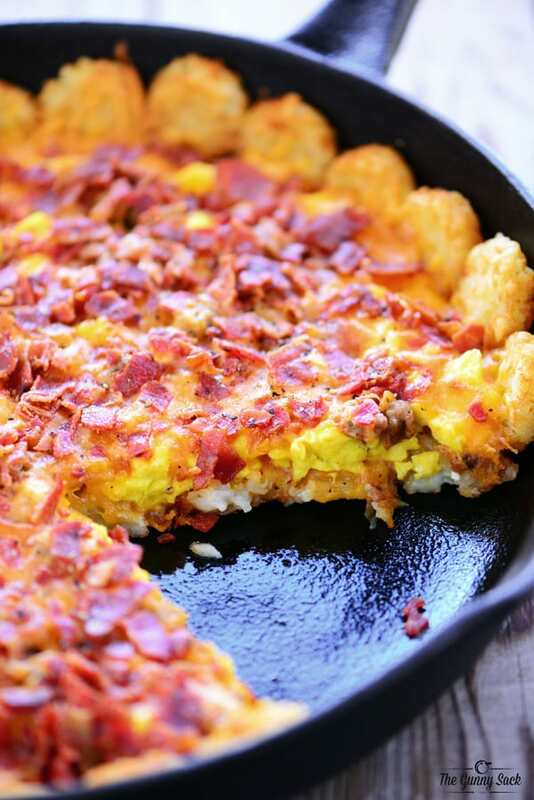 I am making this today, I see to smash the bottom tots, but not the sides right? The the side and bottom tot walls stick together? or will it all just fall apart? thanks! Yes, I smashed them on the sides too. Best of luck! I cook for a summer camp and I’m always looking for fun lunch ideas that the kids will eat. Can’t wait to test this out. Very good and easy to make…..My daughter loved it!!!! Tator tots are basically formed hash browns, so yes. Crispy crowns? Yeah they are like little hash browns!! Funny how stuff is different in different countries!! Would love to visit!! I’ve never tried freezing it. I have a really small freezer so I rarely freeze meals. Since this recipe involves multiple steps in the baking process, I would suggest freezing it after the final baking, but before adding the toppings. How delicious and easy! 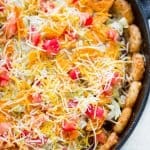 My husband loves tater tots and tacos so this will be his favorite! I can’t wait to try this! It has everything I love! And my family loves! thx! This looks so good! Tater tot crust is genius! Is there something else I can use instead….